I discovered the theme for this month’s Sugar High Friday on the same day as I visited Bicton Park with O and the children last week. 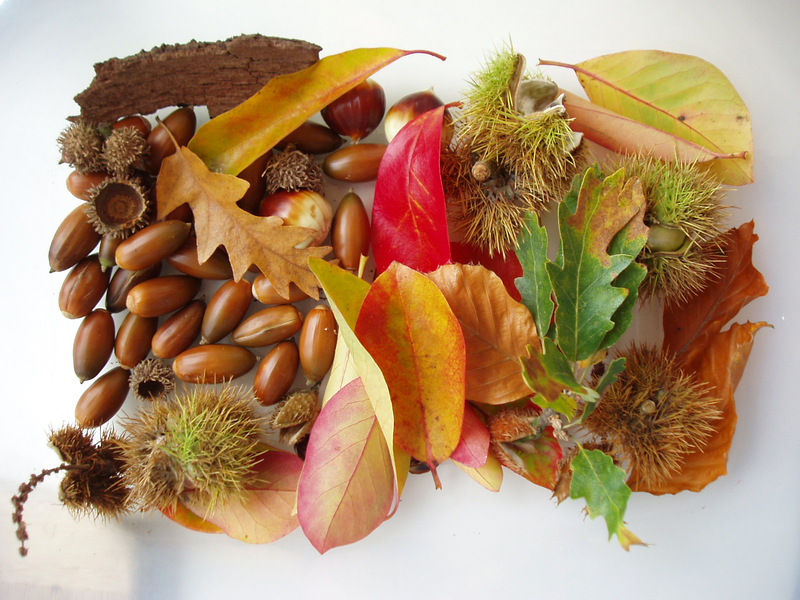 The gardens were gloriously awash with autumal colours that day and although we suffered the inevitable attraction of an indoor play area (complete with ball pool), L, M and T also returned home after having had a wonderful time collecting this assortment of nuts and leaves. M carried them proudly into her Preschool the next morning. Despite having absolutely no spare time at the moment (it’s half-term this week, O is working hard and T is 18 months, which means endless cupboard-opening, escapeeism, finger-trapping and pebble-gathering), I couldn’t miss an opportunity to celebrate Autumn with a warming, spiced recipe … the theme chosen by Anita of Dessert First. I particularly wanted to use some chilli chocolate made locally by the South Devon Chilli Farm. 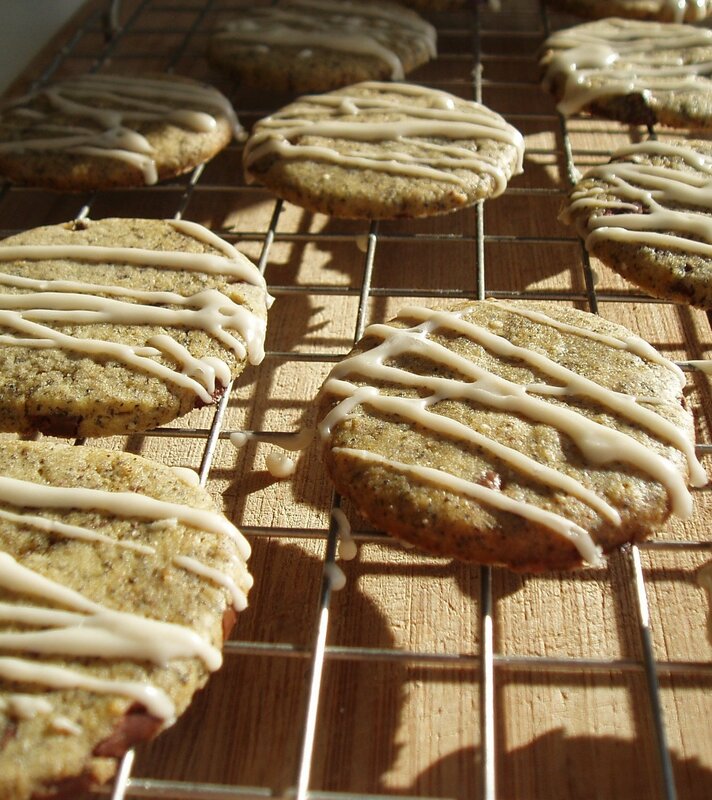 I have also wanted to try a recipe I noticed a while ago that uses tea leaves to add flavour to biscuits. Although this particular recipe suggested using Lady Grey, I wanted something slightly more heady and aromatic for this time of year and chose Masala Chai instead. 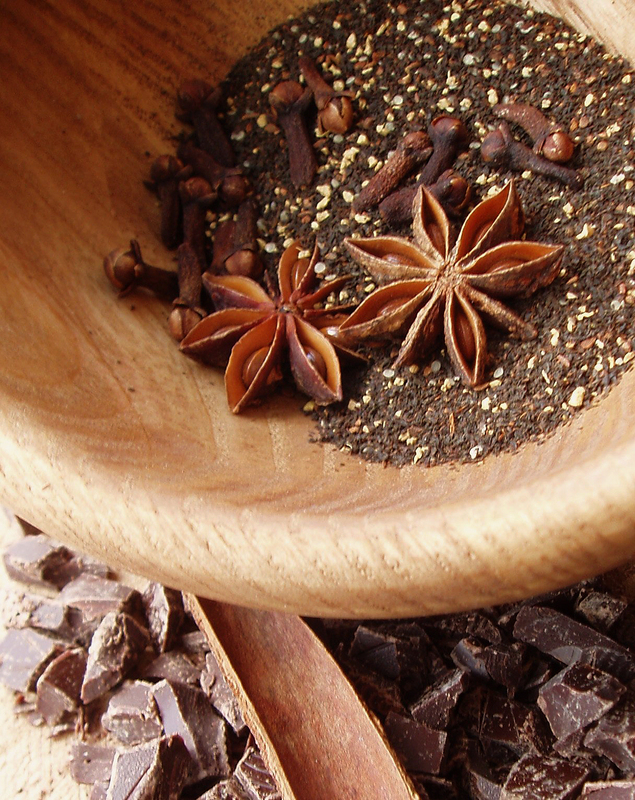 With its mix of cardamom, cinnamon, star anise and cloves, I hoped that this tea would combine with the chilli chocolate to create a warming autumnal treat. Cream the butter and sugar, then beat in the tea leaves, chocolate chips and egg. Fold in the flour and gently combine to a soft dough. Roll into a ball, flatten into a disc and wrap in cling-film. Chill in the fridge for about 30 minutes. Preheat the oven to 180 degrees C. Lightly grease a baking tray. Roll out the dough (use a lightly-floured, opened-up freezer bag on top of the dough to stop it sticking to the rolling pin) to about 1/4 inch thickness. Use a round biscuit cutter (about 2 1/4 inch diameter) to cut out circles. Place on the baking tray, allowing a little space between each. Bake for 8 to 10 minutes until lightly browned. Transfer to a wire rack to cool. To make the icing, sift the icing sugar into a bowl. Gradually beat in the tea until the icing is smooth and not too thick. Drizzle over the biscuits and leave to set. What a fantastic idea! I’ve loving the look and sound of these. They really are (*were*!) very tasty, Mallika. I’ll definitely be making more. My husband likened them to mulled wine in a cookie … but perhaps the greatest endorsement came from the fact that my fussy 3-yr old couldn’t eat enough of them!